As soon-to-be former Michigan Supreme Court Chief Justice Cliff Taylor prepares to clean out his office and contemplates life after the Supreme Court, the likely new chief justice is already thinking about the work that lies ahead. And who is that, you ask? The court’s selection of a new chief won’t take place until after the first of the year, but barring an almost unimaginable change of circumstances, say hello to soon-to-be Michigan Supreme Court Chief Justice Marilyn Kelly. With Taylor off the court, the “majority of four,” as Justice Elizabeth Weaver was so fond of calling Taylor and Justices Maura Corrigan, Robert Young and Stephen Markman, now becomes the minority of three. Don’t look for Weaver to support any of these folks as the new chief. So, who does that leave? Justice Michael Cavanagh has served two terms as chief justice already. Weaver had her turn as a one-term chief. In fact, many speculate that the friction between Weaver and the “majority of four” was created when they didn’t support her for a second term and ensconced Corrigan as chief instead. Corrigan served two terms, followed by Taylor’s two terms as chief. Weaver has had plenty to say about Corrigan’s and Taylor’s stints as chief. Incoming freshman Justice Diane Hathaway needs to get in a few years of service before she would be a credible candidate for chief justice. Enter Justice Marilyn Kelly. Kelly has yet to serve as the chief justice. 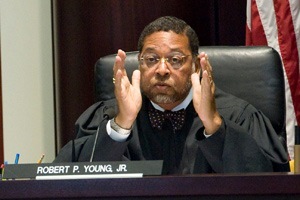 Weaver has previously urged the court to elect Kelly as chief. Kelly and Weaver frequently see eye-to-eye on administrative matters and many of the legal issues presented to the court. Kelly can count on the support of Cavanagh and Hathaway, who are politically and philosophically simpatico with Kelly. Kelly, of course, will vote for herself. So, there are four votes for a new chief. And that’s all you need to shift the administrative power on the Michigan Supreme Court.